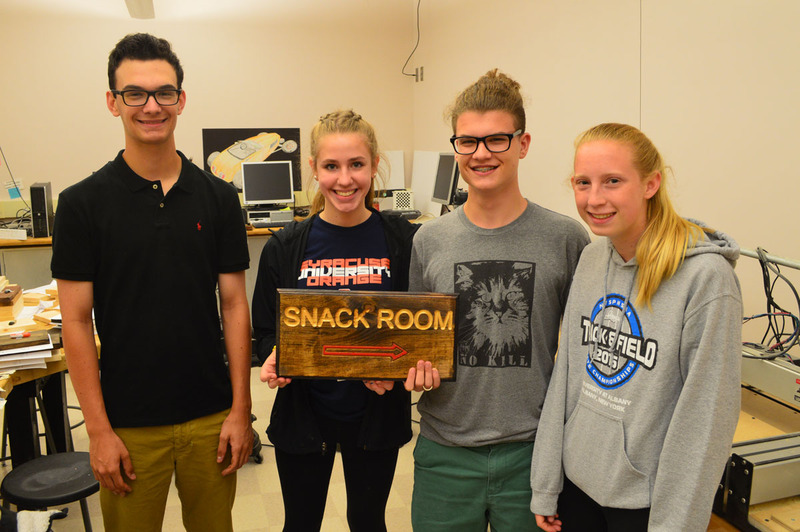 Freshmen Michael Leahy, Autumn Conzone, Ethan Lenney and Annie Patwell made signage in their Design and Drawing Production class that will be displayed in the school cafeteria. Columbia High School students are getting a feel for the small business world with a manufacturing project in their Design and Drawing for Production class. The students are making custom wooden signs for school staff using computer software and a CNC router that carves the design into wood. Then they stain or paint the sign and deliver it to the customer. The project has taught students about sales, manufacturing, customer service and teamwork. “It’s experience in running your own business,” said Annie Patwell ’21. Ms. Patwell and her co-workers Autumn Conzone ’21, Michael Leahy ’21 and Ethan Lenney ’21, have sold 18 signs so far. For each sign, they have the staff member, or customer, fill out an order form while going over the various options of the sign’s size, fonts, paint color or stain. Once delivered, the form of payment is an evaluation submitted by the customer. On Tuesday afternoon, the group of students delivered an order to the high school cafeteria. The rectangular wooden sign, which they stained in the wood shop, said “Snack Shop” and had an arrow pointing to the right. Kitchen Manager Jennifer Wilcox plans to hang it in the cafeteria to direct more traffic to the snack shop which is located off to the side of the main lunch lines. The project, which has 31 different companies, is overseen by technology teacher Steve Ford. It not only teaches the students the software and hardware knowledge, but also the soft skills that are so important in the real business world.